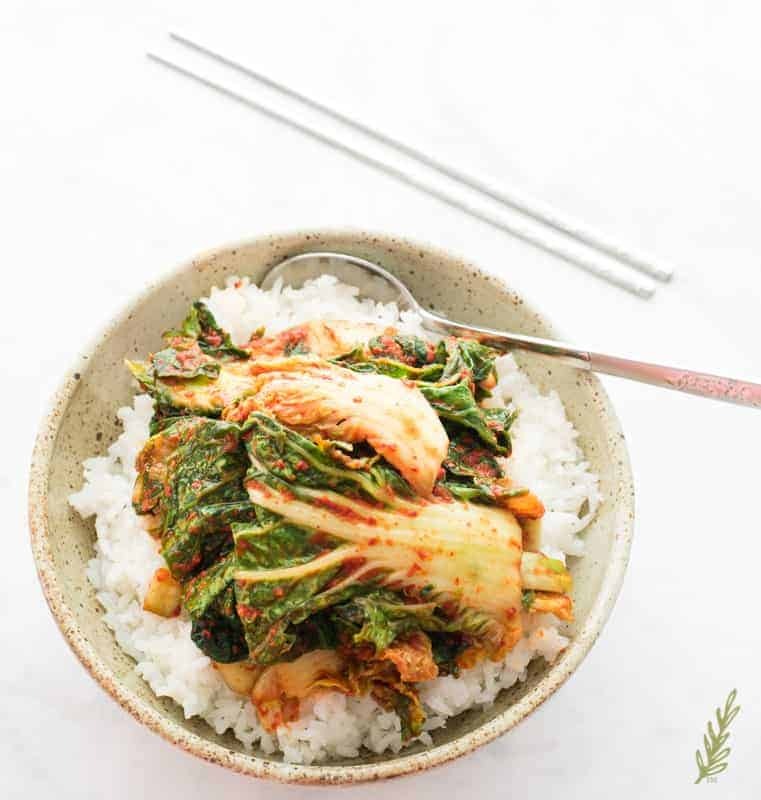 I know you’re thinking, “Why is the this chick attempting to share a Korean recipe?” Well, friend, that’s a great question, and the answer is: “Because I can.” No shade, but I really can. My step-father was from South Korea- where, in Korea, I have no idea- but he could barely speak English, and never made an attempt to learn. He did ensure I knew how to prepare all of his favorite Korean foods, though. The first thing he taught me to make was Baechu-Kimchi (or Napa Cabbage Kimchi). The rule was: you make this kimchi in November, so that it has enough time to properly ferment. Since I’m not Korean and have weird cravings at all times of the year, I don’t hold fast to that rule. I make Baechu-Kimchi whenever I feel like it. Now, you can too. Why is kimchi becoming so popular? Well, along with other fermented foods like: kefir, kombucha, and pickles; kimchi is supposedly good for a healthy gut. Many believe that a healthy gut is the catalyst for all sorts of other health benefits- including the prevent of cancer and an increase in good moods. 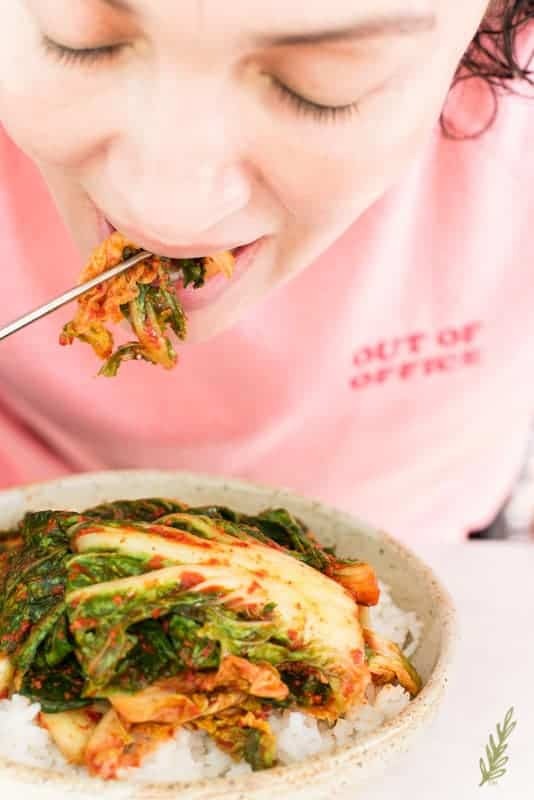 I’ve been eating kimchi and other fermented foods for a lifetime and I’m still as grouchy as ever, so I can’t sign off on that latter benefit. Who knows, though? What I do know is this Baechu-Kimchi (Napa Cabbage Kimchi) is quite tasty. I read somewhere that kimchi, and the Korean tradition of kimjan (group kimchi preparation) is now an intangible cultural heritage item. United Nations Educational, Scientific, and Cultural Organization (UNESCO) has deemed it so. 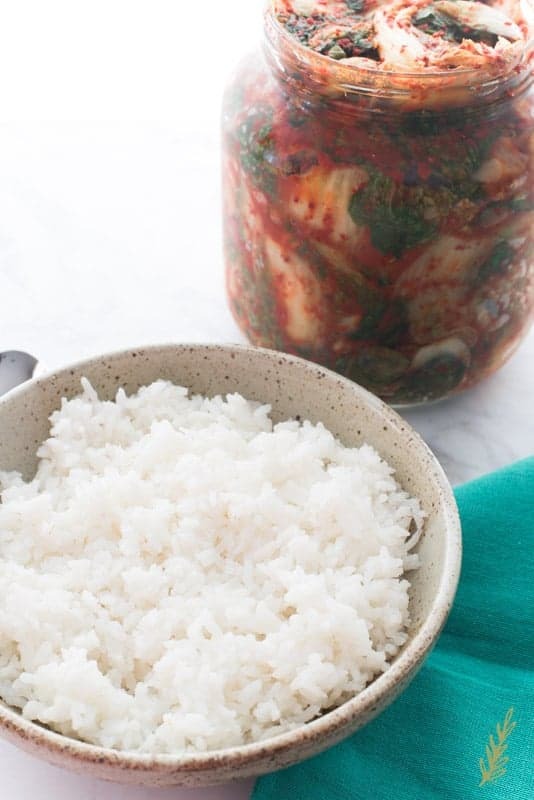 At a time where food needed to be preserved if it was to be enjoyed throughout the year, the process of an entire village gathering to make enough kimchi for the year was a daunting- albeit shared- one. It is this gathering, or kimjan, that still occurs throughout the country around November. In Korea, the kimchi season is a big deal. When my Soldier was stationed in South Korea, he went on a “field trip” of sorts, just outside of Yongsan, where he helped the ajummas prepare the Spring kimchi. He said one of them slapped him because he wasn’t putting enough of the red pepper paste in between the leaves. If you know Héctor, you’re not surprised. He likes to be rebellious. Of course, the one who does listen misses out on the field trip because she’s stuck in El Paso, TX. I’m not too angry about it. Kimchi seems to be the national dish of Korea, and rightfully so. 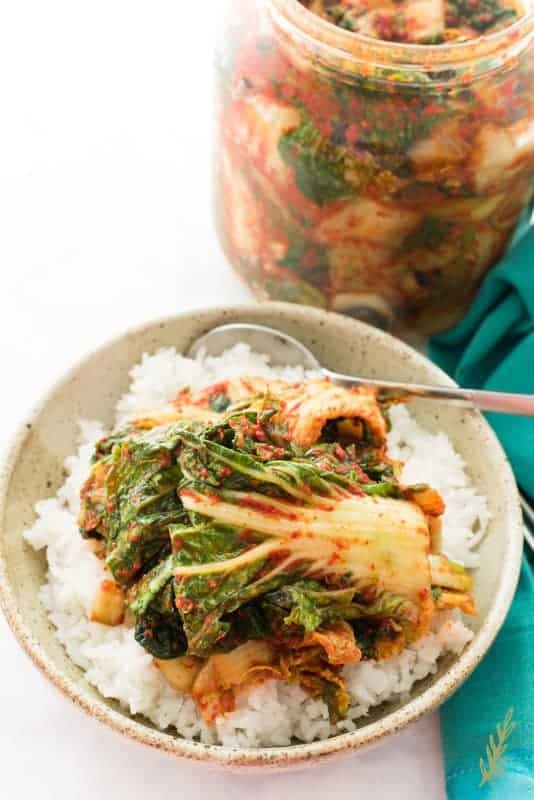 What is in Baechu-Kimchi (Napa Cabbage Kimchi)? It’s napa cabbage that’s been brined, then coated in a spicy red paste. This is left to ferment for a few days to develop a tangy, spicy flavor. That’s the long a short of it. Obviously it’s a bit more involved, and the process spans days. Traditionally, the head of cabbage is split lengthwise. I don’t do this because I don’t own a glass jar that large enough to hold an entire- unchopped- head of cabbage. Instead, I chop my cabbage into, somewhat, bite-sized pieces. 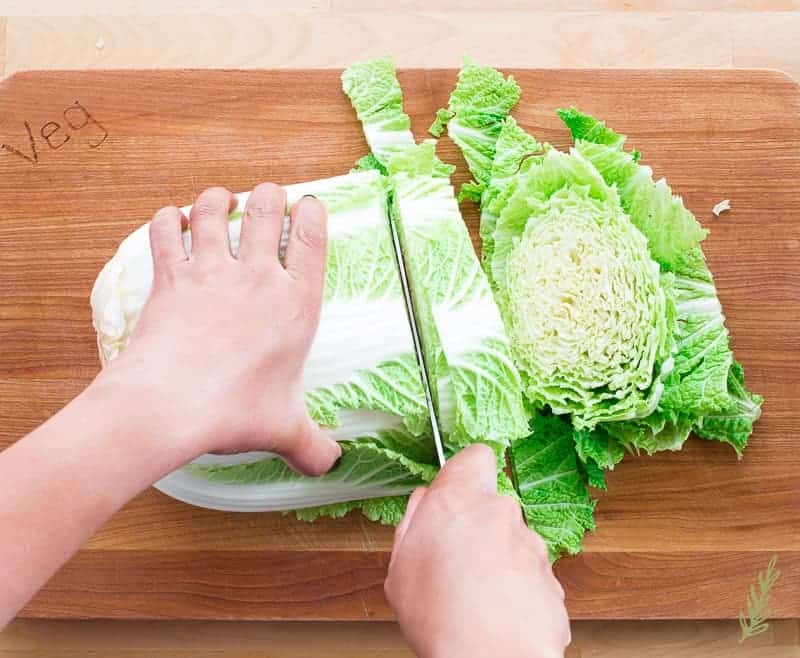 The truth is you’re going to have to cut the cabbage down anyway, so it’s no biggie to do it now. 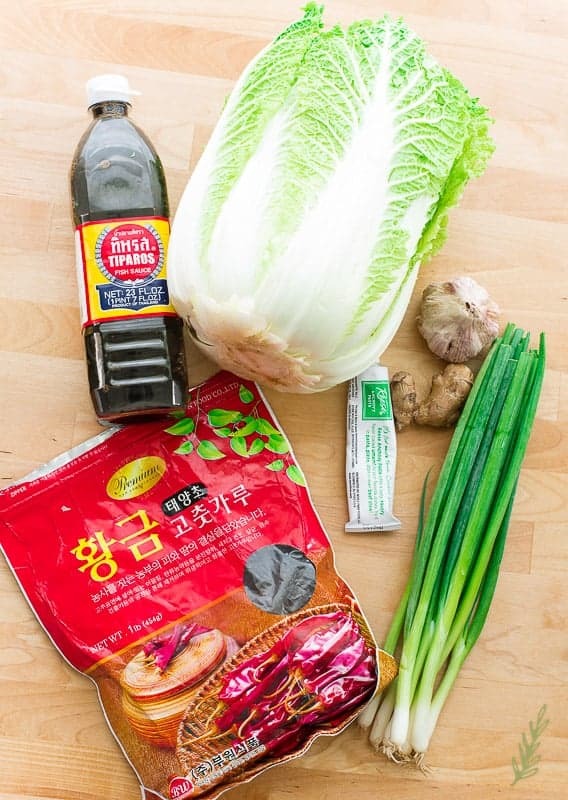 In addition to salting the napa, you need anchovy paste and fish sauce, both of which means this Baechu-Kimchi (Napa Cabbage Kimchi) won’t be vegetarian. I’m sure you can omit both, but it may take longer to get that proper fermentation and the classic kimchi flavor. Another essential ingredient is Korean red pepper flakes. This is a must because, without it, you don’t have the spice kimchi is known for. If you can’t find the pepper flakes, gochujang, or red pepper paste is an acceptable substitute. Finally, daikon radish, green onions (of which, I like to use a lot), fresh ginger and garlic are also utilized. Confused? Don’t be. Banchan is Hangul for side dishes. If you’ve ever been to a Korean restaurant, you’ve been served those little plates of all sorts of deliciousness. They’re the equivalent of our BBQ side dishes. But, kimchi only makes up a small fraction of those banchan. When you go to a Korean restaurant and ask for, “More kimchi, please,” don’t be surprised if all you are brought out are pickled cabbage(s). If you want more banchan, ask for that instead. When preparing Baechu-Kimchi (Napa Cabbage Kimchi) you need to brine the cabbage. 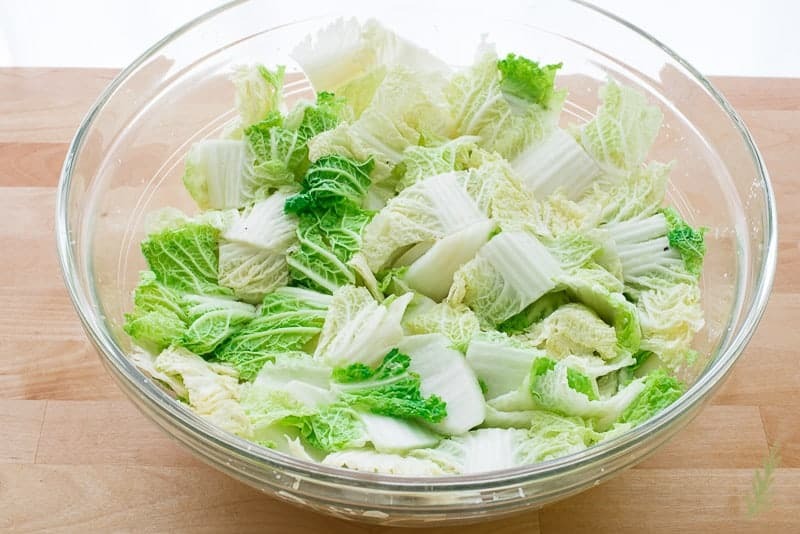 While I didn’t quite understand what he was trying to impress upon me, the best I could get from my aboji‘s ([step-] father’s) broken English was that brining the cabbage for at least an hour draws out excess water from the leaves and it kills off bacteria. Now, I was a fourteen-year-old kid at the time; it was only later that I learned that in order to preserve something you need to make it as dry as possible. In turn, drawing out excess moisture from the cabbage leaves means it can absorb more of the flavor you’re attempting to impart onto it. Killing off bacteria- well, that I didn’t need to learn more about. I don’t want to die- simple. 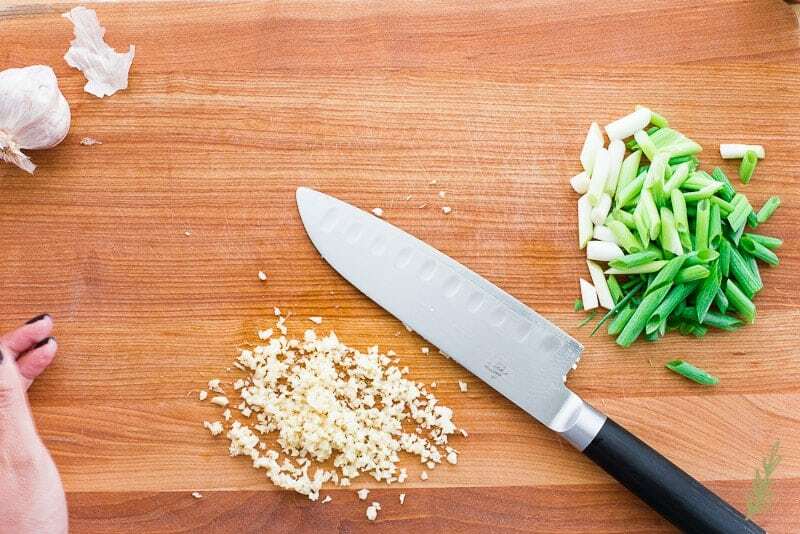 So, grab a cutting board, a chef’s knife, and your head of napa cabbage. 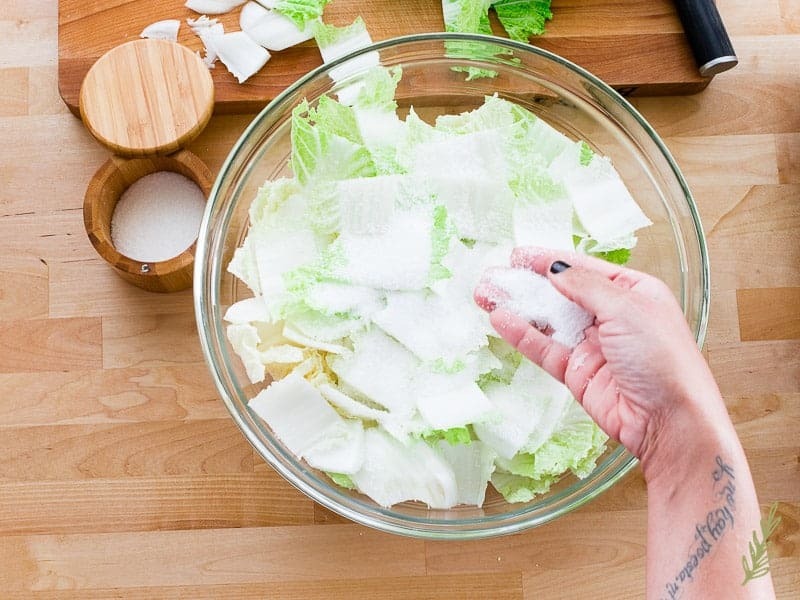 Don’t bother washing the cabbage, we’ll rinse it off quickly after allowing it to salt. Some people prefer to soak their cabbage in a saltwater brine. This wasn’t the way I was taught. Instead, I cut the napa cabbage in two-inch thick pieces. I don’t even bother to separate the leaves because they naturally come apart as I chop. Put the cabbage leaves into a big mixing bowl. Generously salt- I mean generously salt the cabbage, and allow the salt to penetrate the leaves for at least one hour. There have been times where I totally forgot my cabbage and left it to salt for two. Once the brining time is up, give the leaves a quick rinse and squeeze them as dry as possible. This rinse may seem counter-productive, “Why’d we salt to remove moisture just to rinse it in water.” It’s not though. We need to rid the cabbage of all of that excess salt, and we’re going a step further to dry the rinsed leaves. Dump the leaves into the center of a clean kitchen towel. Pat the leaves as dry as you can with another towel, or with a couple of paper towels. For some wacky reason, I don’t have a shot of the shredded daikon radish. Daikon looks like a white carrot, only thicker. You can omit it if you want. I’ve made it without and it tastes just as good. Shred the daikon. The flavor for our Baechu-Kimchi (Napa Cabbage Kimchi) will come from our aromatics and the red pepper paste we’ll make. 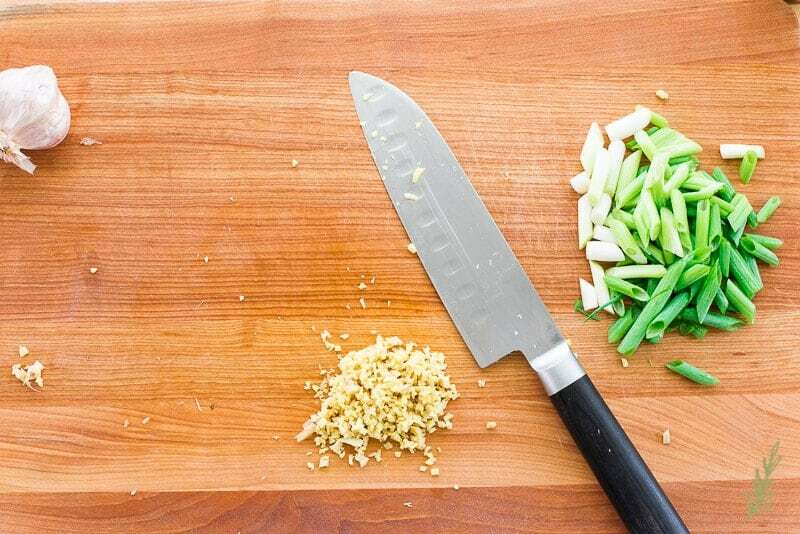 Start with the green onions. Lop off the hair roots, and discard or save them for a stock some other time. Take off the outer leaves (if they look brown or wilted) and discard these. 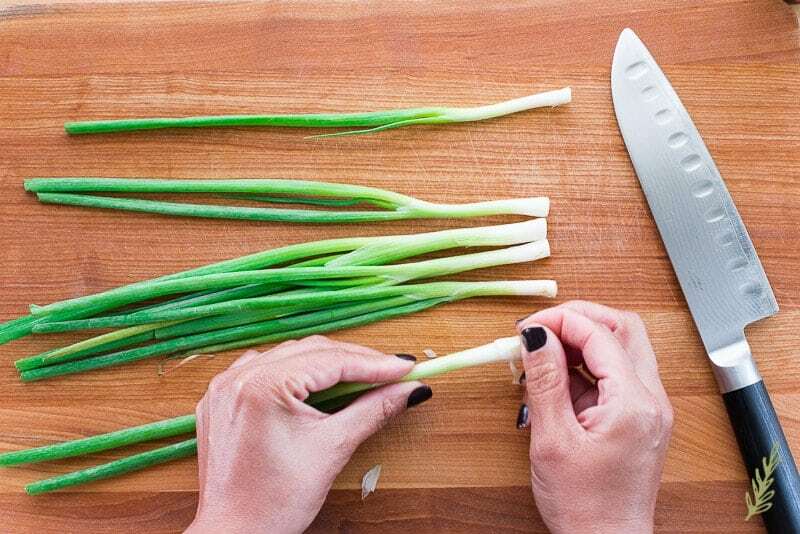 Use your chef’s knife to cut the green onions on the diagonal. 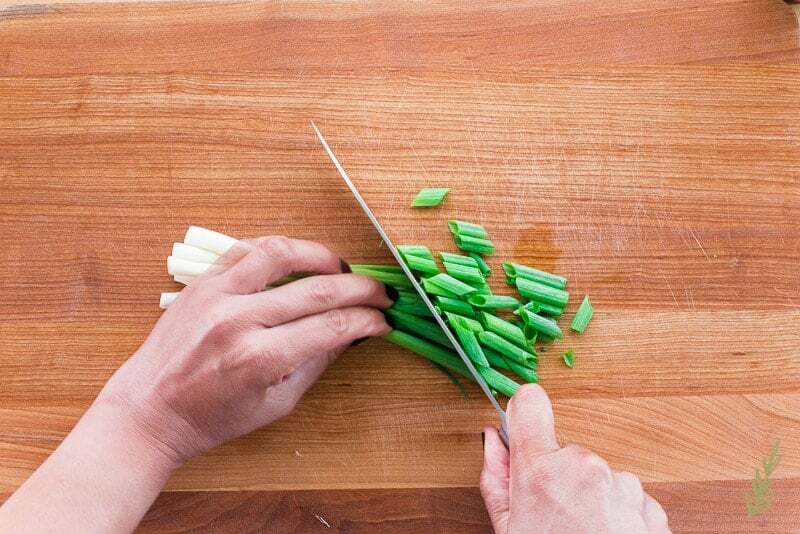 I love the taste of spiced, fermented green onions, so I leave them a bit larger than you may prefer. Set the onions to the side. Again, this is where using a large cutting board comes in handy. 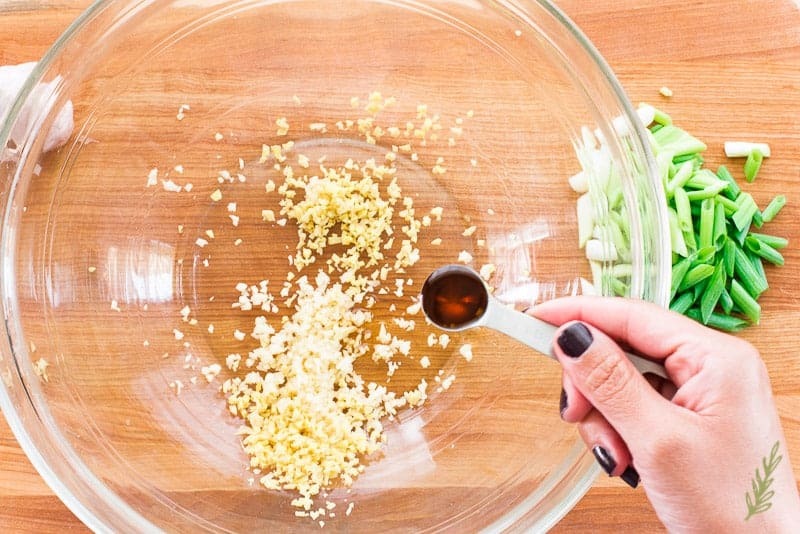 Mince your peeled garlic cloves. Then do the same with your peeled ginger root. 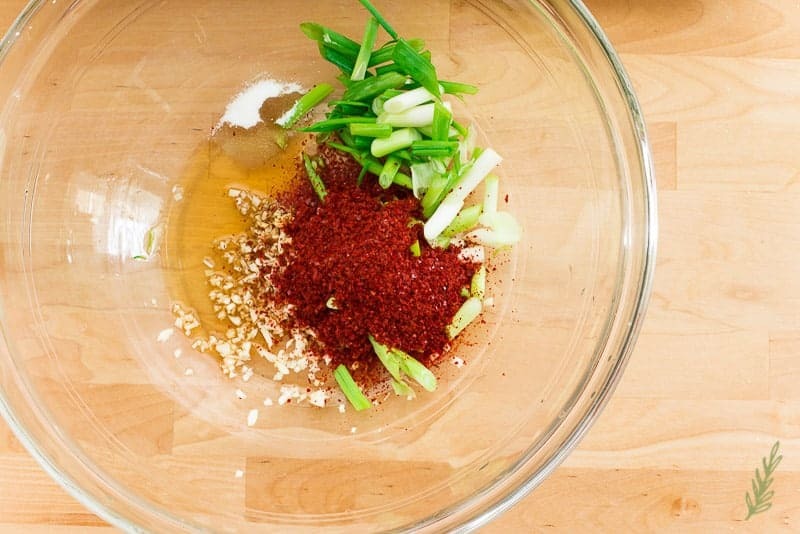 Now that all your veggies are prepped, in a large bowl, combine the garlic and ginger. 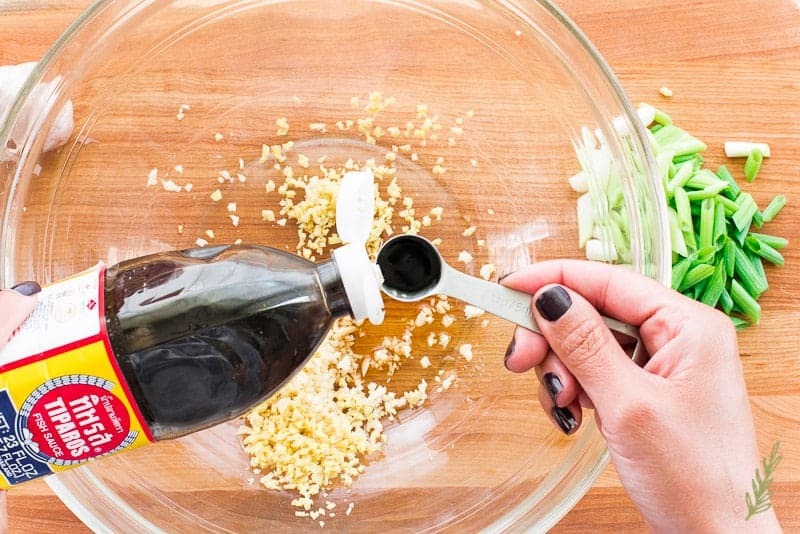 Then add sesame oil to the bowl. Fish sauce is what, along with the anchovy paste, also flavors our kimchi. I’ve tasted kimchi made without out it, i.e. “vegan kimchi” and it tasted like the imposter that it was. If you absolutely must eat vegan kimchi then I guess you’ll like it. I don’t. Sugar is what kicks off the fermentation of the kimchi and it is added to the bowl along with the red pepper flakes, daikon, and the green onions. I mix this all together with a smidge of hot water to create a paste for rubbing into the cabbage leaves. Once the pepper paste is somewhat…well…pasty, add the limp cabbage to the bowl and massage the pepper paste into the leaves as much as possible. You want the leaves to be fully covered. Pack the cabbage into a glass jar, or a traditional ceramic onggi. 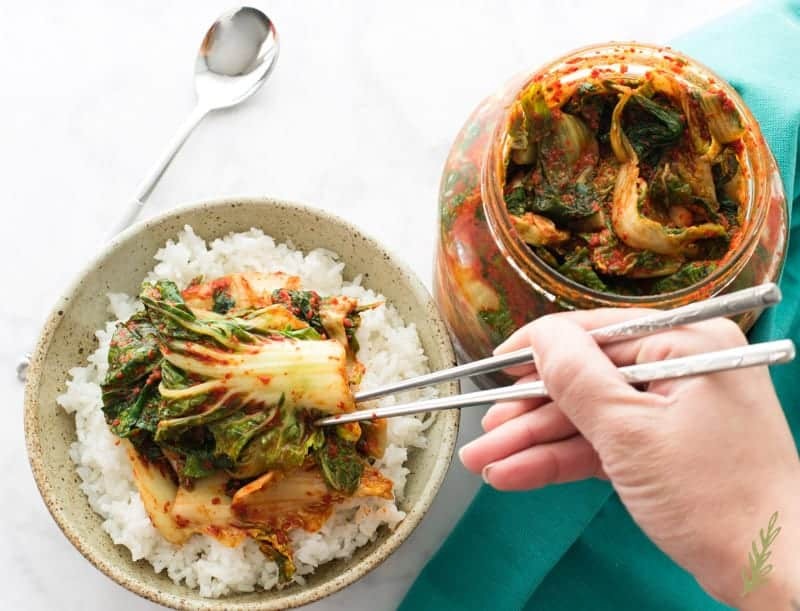 Cover the jar and allow the kimchi to sit at room temperature for one to three days. Keep an eye on the kimchi. You’ll need to “burp” the jar once a day to release the pressure that’s building in there from the fermentation. After twenty-four hours, the kimchi may be transferred to the refrigerator to slow down the fermentation. I prefer to have a tangy, really fermented kimchi so I leave mine at room temp for the full three days before transferring to the fridge. If you’re a kimchi novice, I recommend the one day ferment. 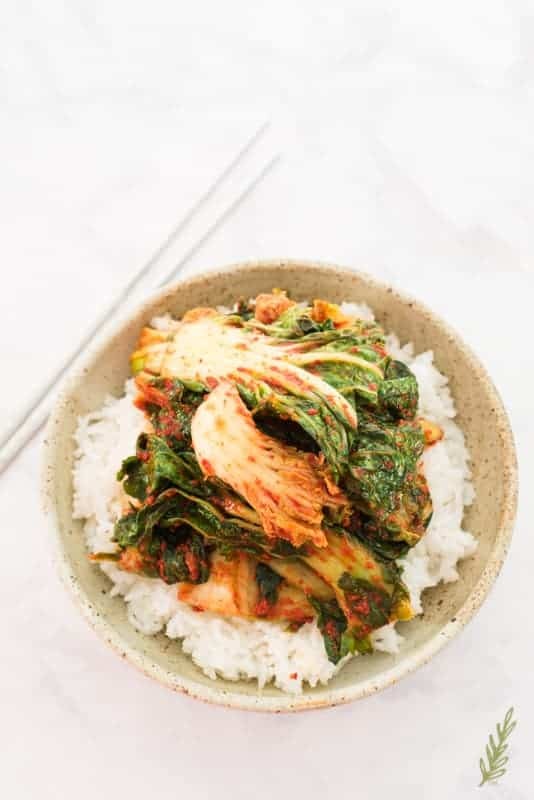 My most favorite way to enjoy Baechu-Kimchi is over steamed white rice. That’s it. I loooooooove kimchi so much I can eat it on its own. Does my breath smell potent afterwards? Yes. Do I repel my husband because of this? Again, yes. Do I care? Not really. It’s good, and it’s good for me, and that’s why toothbrushes and mouth wash exist. The other way to serve kimchi is as a banchan. As a side for bulgogi (marinated beef), spicy pork, or kalbi (Korean BBQ short ribs). 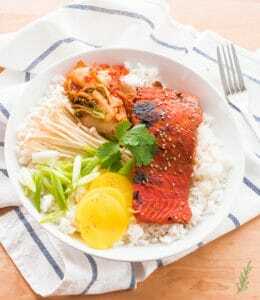 This Miso-Ginger Salmon bowl was leveled-up by the addition of kimchi. After a week, or two, stirring it into kimchi-jigae (or Korean kimchi stew is another idea). 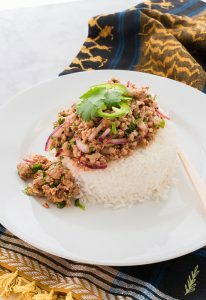 But, ultimately, over white rice is where you’ll get the most bang for your buck. I’ve kept kimchi in the fridge for as long as two weeks, and while it tastes more tangy and almost sour (like sauerkraut) it still tastes amazing that far out. Be sure to keep refrigerated. Don’t let it sit out on the counter for too long because you don’t want to introduce bad bacteria to your delicious batch of kimchi. Too many pictures and not enough tasting got the better of me- excuse me for a minute…. …okay, be sure to pin this recipe for later. What are you waiting for? Go get started on your batch of Baechu-Kimchi! Cut the cabbage into bite-sized pieces- about 2" wide. Put the cabbage leaves into a large mixing bowl and cover the cabbage in the salt. Make sure all of the leaves are coated in salt. Allow the salt to sit on the cabbage for 1-2 hours. Once the brining time is up, rinse thoroughly under cold, running water. Strain the leaves well, then and squeeze them as dry as possible. Lay the leaves onto a clean kitchen towel, then pat the leaves as dry as you can with another towel, or with a couple of paper towels. Combine the sugar, sesame oil, fish sauce, anchovy paste, gochugaru, and 1 tablespoon of the hot water in a large bowl (the same bowl you used for salting the cabbage is great). Make a thick paste, the consistency of tomato paste. Add more water if needed. Add the green onions, garlic, ginger, radish to the paste. Use your hands to add the cabbage to the paste in the bowl and massage the pepper paste into the leaves thoroughly. You want the leaves to be fully covered. Pack the cabbage into a glass jar, or into a traditional ceramic onggi. Cover the jar and allow the kimchi to sit at room temperature for 1-3 days. 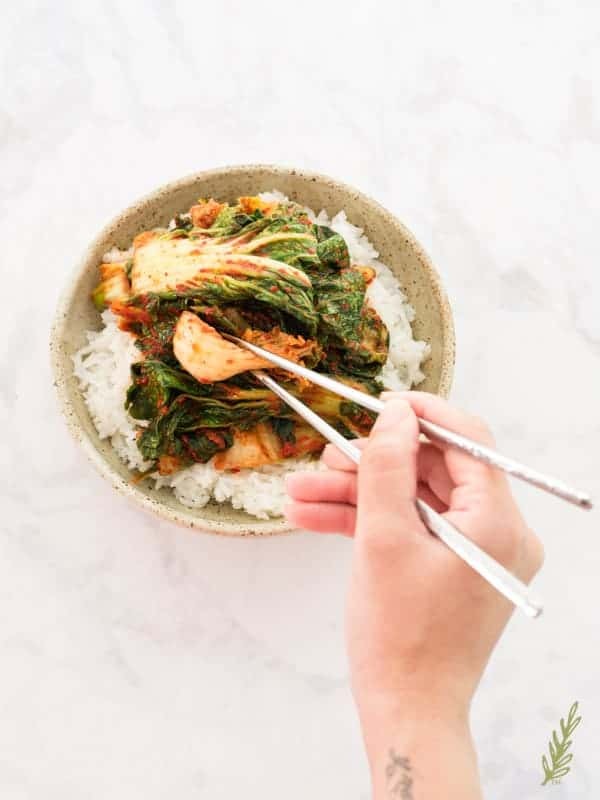 Keep an eye on the kimchi as you may need to "burp" the jar once a day to release the pressure that has built up during the fermentation process. If the lid has started to bulge, twist the lid open to vent it a little, then recover. After 24 hours, the kimchi may be transferred to the refrigerator to slow down the fermentation process considerably. If prefer to have a tangy, really fermented kimchi, leave it at room temperature for the full 3 days. If you're a kimchi novice, I recommend the 1 day ferment. After you've transferred the kimchi to the refrigerator, it's best if it's consumed within 2 weeks. Whenever working with fermented foods, be sure that everything used in its production is clean and sanitized. Be sure to keep the kimchi properly refrigerated. When serving, remove the amount you're going to consume from the jar with clean tongs or a spoon and return the rest to the refrigerator. Don't allow kimchi to sit out on the counter for too long. 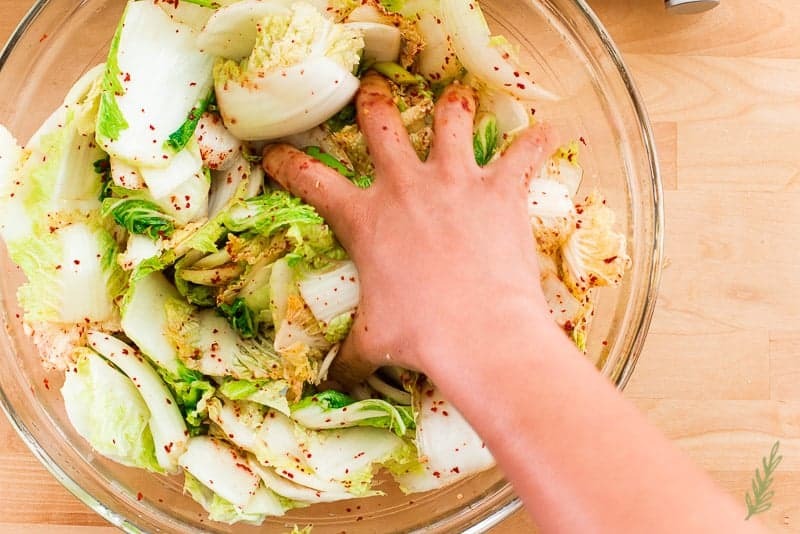 You don't want to introduce bad bacteria to your batch of kimchi. Great presentation!! I would have never even thought of this!! Oh yum! I actually tried kimchi for the first time not too long ago. I really loved it! I love kimchi so I am excited to try this! Looks fantastic. Thanks, Amber! I think you’ll love it. This looks so delicious and healthy! I’m trying to eat cleaner this year. I’ll have to add this to my meal plan. This is great for getting that good bacteria that we all need. 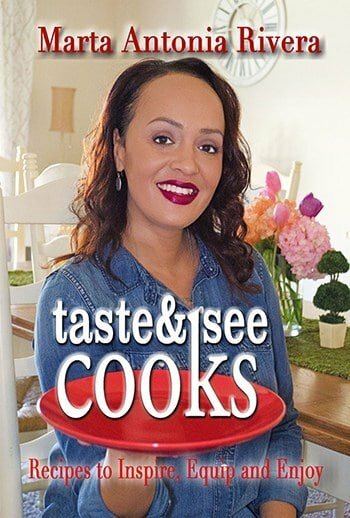 I’ve never tries anything like this but it sounds delicious! 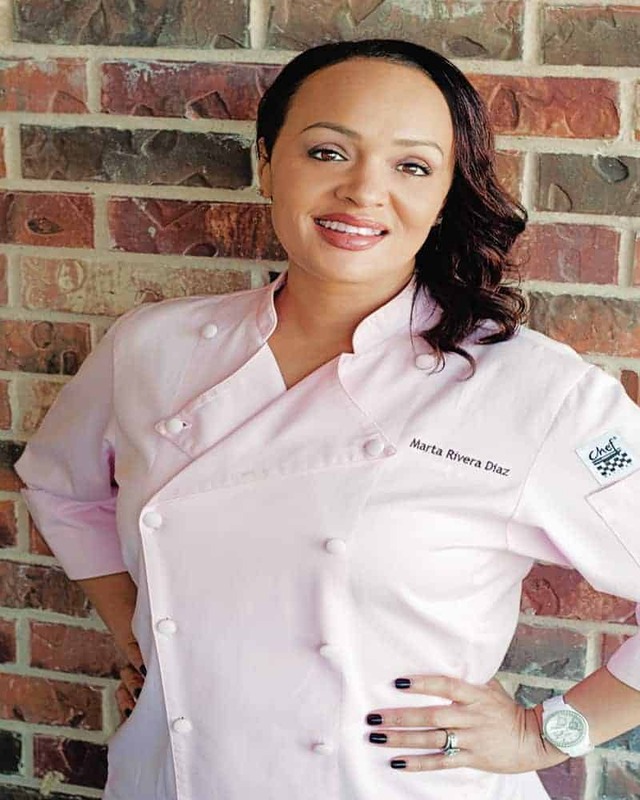 It’s a great way to learn a little about the fermentation process, Paula. 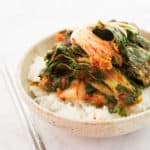 I love homemade kimchi and they’re the best when eaten with warm rice. Just thinking about it already made me hungry! Warm rice and kimchi are THE best!!! This looks amazing!!! I want to make this tonight! You totally should, but it takes a few days to ferment. So worth the wait, though. I’ve never tried Korean food but this looks yummy! You definitely need to try Korean. I crave it about once a month. This looks absolutely delicious! I love Korean food and kimchi is a favorite! Your pictures are so beautiful too! Thanks so much, Chanel! I appreciate that!